Saina staged a brilliant comeback from a game down to beat Nozomi Okuhara of Japan 10-21, 21-14, 21-14 in the second round. This was the 28-year-old shuttler's second straight win over the Japanese in a space of six days. With the win, Saina set up another mouth-watering clash against Tai Tzu Ying, who trounced Gao Fangjie 21-12, 21-17. Okuhara took Nehwal by surprise in the first game to wrap it up 21-10 in next to no time. However, the Indian found her footing from the second game onward. A run of six straight points from 4-4 allowed the Indian ace to open up a 10-4 advantage and from thereon, Saina kept coasting. The Denmark Open finalist won the second game 21-14 to force the decider. Saina had the control in the decider as she managed to maintain a healthy lead after a tight start. She opened up a four-point lead at 9-5 and didn't let Okuhara close the gap. The former World No 1 eventually converted the first of her three match points to register another memorable feat. Later in the day, PV Sindhu also booked a place in the last-eight with a rather easy win over Sayaka Sato 21-17, 21-16 in the second round. Meanwhile, defending champion Srikanth survived a scare against Korea's Lee Dong Keun to enter the next round. After enduring a first game thrashing, he recovered well and made the Korean work while sharpening his own accuracy. The fifth seed won 12-21, 21-16, 21-18 in an end-to-end encounter. 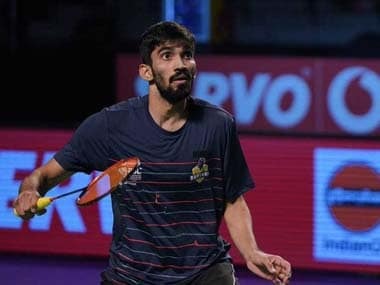 Like Nehwal, Srikanth also faces the World No 1 in the quarter-final. In a repeat of the Denmark Open semi-final, Srikanth will face Kento Momota. The big surprise of the day was Manu Atri and Sumeeth Reddy’s win over former world champions Liu Cheng and Zhang Nan of China. Manu and Sumeeth beat the World No 3 pair 21-14, 21-16 to continue with their impressive form. They will now take on Chirag Shetty and Satwiksairaj Rankireddy in an all-Indian quarter-final on Friday. In the other men's doubles match, Satwiksairaj Rankireddy and Chirag Shetty defeated World No 16 pair Jiting and Qiang in straight games 21-13, 21-19. Women's doubles pairing of Meghana Jakkampudi and Poorvisha Ram was sent packing after a 15-21, 13-21 defeat against fourth seeds pairing of Apriyani Rahayu and Greysia Polii from Indonesia. It was curtains for Sai Praneeth, who lost to Indonesian youngster and Asian Games gold medallist Jonatan Christie in straight games.